Some 13 million years ago, humans began to genetically diverge from our closest living relatives: chimps. But, according to scientists, we're still not all that different from our primate cousins. A common trope for many studies of primate cognition is to compare the intelligence of non-human subjects with that of children. In 2007, a groundbreaking study brought up the theory that monkeys could display the distinctly human quality of rationalizing irrational behavior - an effect called cognitive dissonance. The research, published in the journal Psychological Science, has been picked at by scientists since, with arguments debating the conclusiveness of the study. But other studies before and since have shown primates' impressive handle on complex cognition: great apes can detect deception, monkeys can understand gambling, many species can show empathy. The Psychological Science paper, for instance, compared a monkey's capability for cognitive dissonance to that of four-year-old humans. Now, there's another striking similarity between the brains of monkeys and apes and the brains of young humans. Scientists at the University of St Andrews in Scotland recently published a study in the journal PLOS ONE showing that like young human children, monkeys can understand abstract properties of objects simply by looking at them. "We set out to find out how animals conceive the world around them," said Dr. Amanda Seed, a lecturer at the University's School of Psychology & Neuroscience. ""Do they have any idea that objects have abstract properties, like solidity and weight? Or do they rely on learning arbitrary relationships between what you see, what you do and what you get, in the same way that we learn to stop at a red light?" 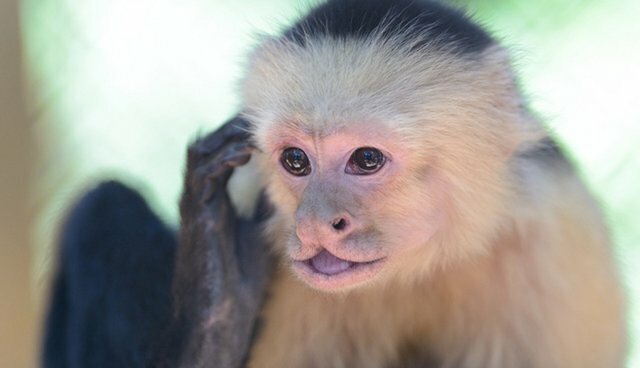 The scientists presented capuchin monkeys, bonobos and chimpanzees with a puzzle: each individual was given a box containing two pieces of string. One string connected to a food reward and could be pulled to bring the food to the subject. The other string was connected to food but was cut in the middle. There were two variations of the puzzle: one where the box was covered but had a representation of the strings on the top of it; and one in which the box was uncovered and the strings attached to food were fully visible. The team found that the subjects performed better when presented with the uncovered box and the visible strings - the puzzle that most "made sense." Seeing the string connected to the food itself was easier to understand. The researchers said that the monkeys and apes could solve the puzzle when they could see the function of the object (the string pulling on the food) - similar to the way that kindergartners behaved when they were given the same puzzle. "Our research shows that learning arbitrary patterns is not actually that easy for primates, and even five-year-old children find it hard," Seed said. "In comparison: choosing a connected string in a functional context is easy. This suggests that these species do have object knowledge and that there is more to their world than meets the eye."